Preakness: Who will tackle Justify? Justify galloping at Churchill Downs. Photo provided by Maryland Jockey Club. Justify — The Kentucky Derby winner is confirmed for the Preakness, and if he starts, it will mark the 22nd consecutive Derby winner to start the Preakness. The last who did not was Grindstone in 1996. 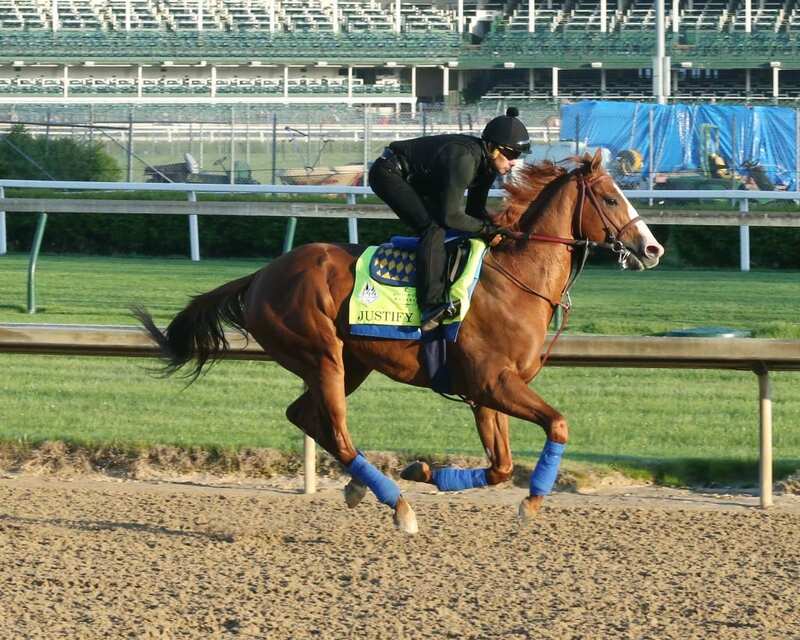 He is expected to gallop at Churchill Downs Thursday morning for trainer Bob Baffert. Quip — The winner of the Grade 3 Tampa Bay Derby also was second in the Grade 1 Arkansas Derby, four lengths behind Magnum Moon. Quip, trained by Rodolphe Brisset, passed on the Kentucky Derby while his Arkansas Derby rival was 19th in Louisville. Quip, like Justify owned by a group including WinStar Farm and China Horse Club, has been confirmed as pointing to the Preakness. Bravazo — The winner of the Grade 2 Risen Star, Bravazo was one of the Kentucky Derby’s longest shots but outran his odds to be sixth after a wide journey. The D. Wayne Lukas trainee, who returned to the track this morning, is one of two Lukas trainees headed to the Preakness and is owned by Calumet Farm. Lukas and Calumet teamed up for Preakness glory in 2013 with Oxbow, and Lukas has six Preakness wins to his credit. Sporting Chance — The other Lukas-trained runner who’s Preakness-bound, Sporting Chance hasn’t been better than third thus far in 2018 and was fourth in the Grade 3 Pat Day Mile on the Derby undercard after traffic troubles. But the son of Tiznow does own a Grade 1 triumph, that coming in last year’s Hopeful Stakes at Saratoga. Lone Sailor — The Tom Amoss trainee was eighth in the Run for the Roses after running second in the Grade 2 Louisiana Derby. He went to the track today for the first time since then, and Amoss commented, ““He had a good day on the track today. I mean, one day doesn’t make a decision [about Lone Sailor’s Preakness status]. We’ll kind of wait and see. I don’t think it’s any secret we’re all looking to see where Justify lands. I’m sure a lot of trainers are interested in how he’s doing.” He said he expected to make a decision by Saturday night. Good Magic — The Kentucky Derby runner-up, beaten 2 1/2 lengths by Justify, this Curlin colt remains on the fence for the Preakness. The Chad Brown trainee has just two wins in his six-race career — but what wins! He scored in the Grade 1 Breeders’ Cup Juvenile to close his 2017 season and then won the Grade 2 Bluegrass Stakes at Keeneland in his second 2018 start before turning in a solid, though clearly second-best, effort in Louisville. Tenfold — Another Curlin colt, this one trained by Steve Asmussen, this one has raced just three times, opening his career with two wins before finishing fifth in the Grade 1 Arkansas Derby. The good news is that he’s talented, lightly raced, and has plenty of upside. The bad: the three horses from the Arkansas Derby to try the Kentucky Derby — Solomini, Combatant, and Magnum Moon — finished 10th, 18th, and 19th, respectively. Tenfold is “probable” for the Preakness, Asmussen said Monday. Diamond King — The John Servis trainee earned a Preakness berth with a win in Laurel Park’s Federico Tesio Stakes in April, his second stakes win over the strip, to go along with a third-place finish in Gulfstream Park’s Grade 3 Swale. But the son of Quality Road is also entered in Saturday’s Grade 3 Peter Pan at Aqueduct and might choose that easier spot over the Middle Jewel.